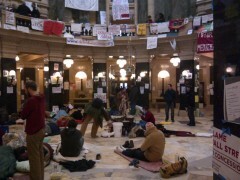 Wisconsin Capitol occupation continues | Fight Back! Madison, WI - Thousands are still protesting at the Capitol here, March 1. Amidst tight security, including erecting concrete barriers outside the Capitol and denying the public entry into the building, Wisconsin Governor Scott Walker delivered his budget address this afternoon. Gov. Walker aims to destroy public sector unions, slash public school funding while increasing state aid for private schools, section off the University of Wisconsin-Madison for further privatization, weaken and eventually eliminate state welfare programs and deny in-state tuition for undocumented students. These are just some examples of the all out attack on working and oppressed people. Felisha Burgos, a student at Rufus King High School in Milwaukee and a member of Voces De la Frontera's Youth Empowered in the Struggle, has been regularly attending protests against Walker's attacks. "I continue to protest in Madison because I believe in my teachers and the rights of state workers, in fact all workers. We were the first state to grant union workers rights and I believe Walker is taking us in the wrong direction. Forward not backward!" she says. 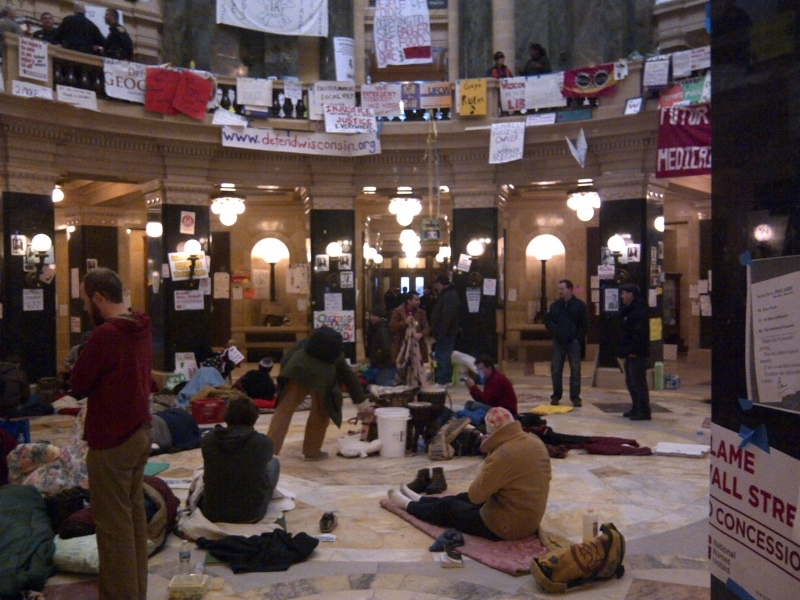 The occupation of the State Capitol has been going through challenges in the last couple days. An incredible protest on Feb. 27 involved hundreds of workers and students and defied a 4:00 p.m. ultimatum to wipe the Capitol building clean of dissent. Then, on Feb. 28 the police had the building locked down all day and welded shut a bathroom window that had been used to sneak in food and supplies so occupiers could stay inside the building when the outside doors were locked. Dozens of people have kept up the visible presence at the Capitol by creating a tent city on the outside, despite very cold nights. March 2, marks the National Day of Action for Education Rights. Dozens of Students for Democratic Society (SDS) chapters will be participating in the action, from Texas to North Carolina, but all eyes are on the protests being planned in Wisconsin. Members of SDS at the University of Wisconsin-Milwaukee are planning a walkout that will include a worker contingent of AFSCME and AFT members. "Tomorrow's protest is important because it will be a big show of solidarity with those at the Capitol," says Peter Adamczak of University of Wisconsin-Milwaukee SDS. "The rally tomorrow will promote a unified voice of the people, not the power of money."